The Award was received on behalf of both Universities by Dr Oana-Andrea Macovei, Toulouse-Capitole European School of Law (ESL), and Professor Dermot Cahill, Head of Bangor Law School, at the Maison du Barreau (the Headquarters of the Paris Bar) in Paris on March 30, 2017. The Prize was presented by Guy Canivet, Honorary First President of the Cour de Cassation, in the presence of over 70 members and guests of the FBLS Including Jean Marc Sauvet, Vice President of the Conseil d'Etat; His Excellency the UK Ambassador to France, Lord Llewellyn; Madame Sylvaine Peruzzetto, formerly Professor of Commercial Law at Toulouse and now Judge at the Cour de Cassation in Paris; and Sir Robert Aitkens, formerly of the Court of Appeal of England and Wales. The FBLS Academic Committee felt that it was particularly important this year to reward and encourage an excellent, young programme which demonstrated a deep commitment to promoting and successfully developing Franco-British legal relations and understanding. The Academic Director of the FBLS, Dr Vivienne Forrest, said: "one of the obvious strengths of the programme, which caught the attention of the Committee, was the emphasis it placed on a very enriching comparative approach to law studies, skilfully linked to the study and understanding, in a broader context, of the two different cultures and legal systems". Previous winners of the Robertson-Horsington Prize include Université Paris 1 Panthéon-Sorbonne and King's College London; Université Rennes 1 and Exeter University; and Paris X (Nanterre) and Essex Universities. The double degree law programme expands students' intellectual formation; allows them to navigate with ease between the Common Law and Civil Law worlds; presents an excellent example of transnational legal education; and offers students many opportunities such as internships, summer school participation and mooting. 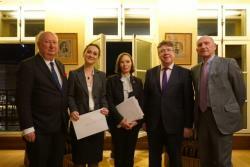 In addition, this programme is now part of the 17-member European School of L Pictured at the award ceremony, L-R: Simon Horsington, Barrister, 4-5 Grays Inns Square Chambers, London; Dr Oana Andreea-Macovei; Vivienne Forest, Academic Director, Franco-British Lawyers Society; Prof. Dermot Cahill; Guy Canivetaw consortium centred at the Toulouse-Capitole ESL hub, which supports its growth and promotion. Paying tribute to Claudine Chambert, formerly Head of the International Office in Toulouse, and now Secretary General of the European School of Law; and Professor (now Judge) Sylvaine Peruzzetto, both of whom – along with Professor Dermot Cahill – set up the programme between the two Universities, Professor Cahill commented: "the LLB in English Law & French Law / Master I in International Law continues to go from strength to strength. Major law firms and multi-national enterprises are very interested in graduates of the programme, because this transnational double degree law programme produces students who can navigate easily between the Common Law and Civil Law worlds. "We are delighted that the Franco-British Lawyers Society (FBLS) has awarded the programme the Robertson-Horsington Prize 2017, recognising that this degree programme is an excellent example of a genuinely transnational legal education law degree. It has been a pleasure working with the European School of Law’s team at University of Toulouse-Capitole: we work together jointly, all the way from the initial selection of students, to maintaining the programme’s relevancy. The students' intellectual development and formation on the programme, as well as the Franco-British cultural experience they acquire, leads to the production of nimble, fertile minds, who see new opportunities before them that students in previous generations could only dream of. "Spending two years in each country produces a legal mind that has expanded and matured to the point where the law student's personal capabilities are enhanced and highly developed. Establishing this programme with Toulouse-Capitole is probably one of the most significant projects that I have been involved in my career, as I see its potential as pointing the way to the future of innovative international legal education." Professor Wanda Mastor, Head of the European School of Law (ESL) which is centred at the central hub of Toulouse-Capitole, commented: "the double degree LLB in English Law & French Law / Master I in International Law is blossoming, leading to a deepening of the relationship between the two universities, which is now extending to PhD level as well, with Bangor PhD students participating in the ELS Annual PhD workshops, along with research students from 16 other members in the ELS network. "Working with Bangor has been a pleasure for us. So dynamic and focused on the needs of the law graduates of the 21st century, the award of the Robertson-Horsington Prize 2017 to this model clearly highlights the way for ambitious students who want to take full advantage of the opportunities that the international legal market offers. Our students love their time in Bangor, and find the Welsh experience both enriching as well as intellectually stimulating – finding a highly internationalised boutique law school among the Welsh mountains has a touch of magic about it! We are delighted that the programme is attracting many applications as French students increasingly see their future as one that requires them to see a wider world." At the Awards Dinner, Dr Oana Macovei from Toulouse-Capitole stated: "Toulouse is delighted to have been honoured with this Award. We are committed to offering our students with the best opportunities, allowing them advance their education and preparing them during their first two years in Toulouse-Capitole to advance onto the Bangor University LLB in English Law & French Law programme. The Bangor-Toulouse double degree LLB / Master I allows our students have the best Common and Civil Law experience. Students admitted to this programme are dynamic and open-minded, and they see a bright future ahead of them."